This section provides help on configuring your client devices for DHIS Updates. We aim at making it as complete and with as many different clients, devices and configurations as possible. If your device/client/configuration is working and is not listed here and if you would like to help other users, please send us instructions and screenshots for your specific device/configuration and we will publish them on this page. This is the classical DHIS Update method. You need a DHIS dhid client which you can either find on your operating system's ports or package collection or you can download the source code from ftp://ftp.dhis.org/pub/dhis/dhid-5.5.tar.gz. If you are compiling it and want to have built in QRC authentication you will need to install the GNU multi-precision library (gmp). You can get it from here. Read the provided INSTALL, README and dhid.conf.sample files. If compiling, uncompress the source code, cd to its directory, type "make". You then need to create your DHIS host online and edit the dhid.conf file. By default this file is installed under /etc/dhid.conf. Remmeber to protect it with chmod 600 /etc/dhid.conf. Run the dhid daemon and that's it; it should connect to the server, login with the configured parameters and mark your host online. */5 * * * * /path/to/wget -4 -q -O /dev/null "http://YourHostID:YourHostPassword@is.dhis.org/"
And that's it; your host will always be online when you are connected. You can also use wget to update an IPv6 address (AAAA DNS record). The only difference in this case is that you need to ensure that the HTTP request is made using IPv6 and that you have IPv6 connectivity to the Internet. This is the default of wget and can also be achieved with the -6 command line option. */5 * * * * /path/to/wget -6 -q -O /dev/null "http://YourHostID:YourHostPassword@is.dhis.org/"
If you have a router with a dd-wrt firmware you can follow these instructions in order to make it update a DHIS host. 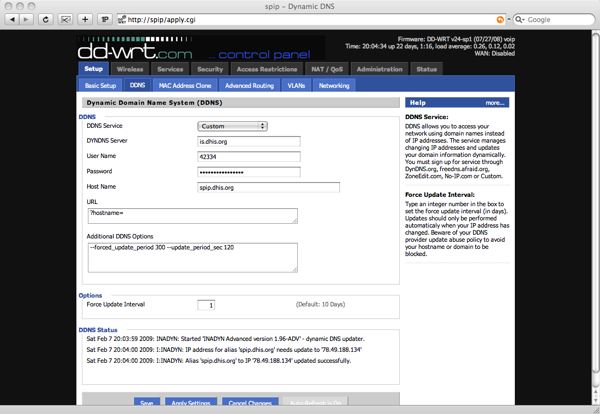 The following picture illustrates a working dd-wrt v24-sp1 voip DHIS configuration; click upon it in order to view it in its full size. 4. Provide your DHIS HostID as the Username and your DHIS *HOST* password as Password. 5. The Host Name is ignored by the server since it is derived from the HostID, but dd-wrt/inadyn complains if you don't specify one, so just put your hostname there. 6. By default dd-wrt/inadyn will just push your hostname to the server. Even if this is ignored, you need to make it a parameter in order for it to work; insert "?hostname=" in the URL box. The actual hostname will be appended to it. dd-wrt/inadyn will update by default every 360 seconds but will also cache and not update if your IP address hasn't changed; this is not good since DHIS requires your client to update periodically regardless of whether your IP changes or not, so you need to tweak with its timers. Add: --forced_update_period 300 --update_period_sec 120 to the additional DDNS options. This will make your router box refresh your IP every 2 minutes if it changes or every 5 minutes if it doesn't change. 7. The Force Update Interval is actually overwritten by 6. so it doesn't really matter what you put there. And that's it; if everything goes well your router will then bring your DHIS hostname online and keep it always up to date. Finally, force an IP address change to trigger the dynamic update. You can use debug ip ddns update to troubleshoot. This configuration will make your router update with the DHIS server every 5 minutes. This configuration was tested and found to be working on an ADSL Vodafone connection using a Thomson ST586-v6 router. The next and final step is to configure the Custom service using the router's Web Interface. Go to Dynamic DNS and enter your HostID as Username and your HostPassword as Password. You may also enter the hostname on the Host box but this parameter is currently ignored by the DHIS server since it is derived from your HostID. And that's it, the router should perform dynamic updates to the DHIS server and the host should become online.